An analysis of 148 of Europe’s common birds has revealed that, over a 30-year period, 57 species (39%) have declined across 25 European countries. 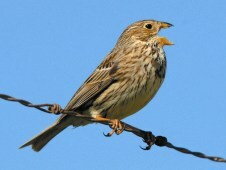 Farmland birds have fared particularly badly, with 300 million fewer birds today than in 1980. These population trends of representative suites of wild birds can indicate the health of the environment, for birds and wider biodiversity. ‘Common’ = species > or equal 50,000 breeding pairs. Characteristic of farmland/forest habitats = > or equal 50% of regional population utilises habitat for breeding / feeding. Species with a European index of low precision and unjustified extreme fluctuations excluded. Source: Pan-European Common Bird Monitoring Scheme (PECBMS): European Bird Census Council/RSPB/BirdLife International/Statistics Netherlands. An assessment in 1994 estimated that 25% of all European bird species were undergoing substantial population declines (Tucker and Heath 1994). In 2002, the Pan-European Common Bird Monitoring Scheme was launched by the BirdLife Partnership in Europe and the European Bird Census Council to provide regional indicators for common bird populations in Europe. Annual breeding bird survey data collated from 25 European countries (in 2012) have been used to calculate regional bird trends and indices for common bird species (1980–2010), taking into account the proportion of the population occurring in each country. Overall, out of 148 bird species, 57 (39%) have declined during this 30-year period. Data can also be combined across suites of species to produce multi-species indicators that show trends in bird populations in key European habitat types. One such indicator has been produced by combining data for 37 abundant and widespread bird species breeding in, and characteristic of, farmland. The results show that the European farmland bird index declined by 52% covering the period 1980–2010, representing a loss of 300 million birds, with decline rates greatest in the late 1970s and early 1980s (PECBMS 2012). A comparison of new and old EU Member States shows that although farmland birds were performing better in new EU countries, their trends appear to be worsening in recent years, now mimicking the trends in old EU countries. It is widely accepted that these declines have been driven by agricultural intensification and the resulting deterioration of farmland habitats, and it is likely that the trends observed are mirrored by other farmland taxa. PECBMS (2012) Population trends of common European breeding birds 2012. Prague: CSO. Tucker, G. M. and Heath, M. F. (1994) Birds in Europe: their conservation status. Cambridge, U.K.: BirdLife International.